Read to the end to find out how to enter a drawing for this book. I highly recommend this book for preschoolers and young readers. 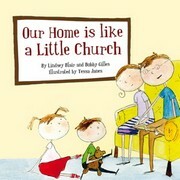 I also recommend that churches promote this book to young families. It is a great storybook that emphasises the role of the parents in teaching children about God. It is the best book on this subject I’ve ever read. It won’t only teach children, it will teach adults about their roles in a child’s spiritual development. To order, go to this link. I will give away one copy of this book. Leave a comment, and I’ll draw a name next Friday, May 7. I am thrilled to see this book. It is my heartfelt prayer that families, and especially fathers, will take seriously their roles to teach their children the truths of the Bible and instill a deep love for Christ.